Just when I’m beginning to be very annoyed at George Clooney he does something really cool like this movie. I’m just sorry I didn’t get this review done in time to upstage the Golden Globes, which gave it both best picture and best actor. 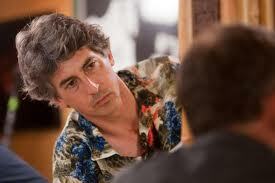 Written by Alexander Payne (Get Schmidt, Sideways), Nat Faxon and Jim Rash and directed by Payne, it’s a “must see.” It was based on a novel by Hawaiian Kaui Hart Hemmings. Just don’t expect a comedy. Matt King (Clooney) is a member of a large family that dates back to the original white settlements in Hawaii. He’s an attorney but also has some money of “his own” so to speak. At the time of the movie his huge extended family is faced with a decision whether or not to sell an enormous parcel of untouched land for commercial and residential use. His life is interrupted suddenly by his wife Elizabeth’s (Patricia Hastie) boating accident, which leaves her in a coma. Unlike a sudden death, the circumstances call for a different kind of care for his two daughters, not to mention his relationships with family and friends. The movie trailer is one of those that makes you think you’ve just seen the entire plot, but mercifully there’s a lot more there. 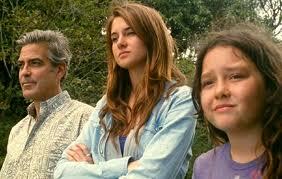 What it does show you is his teen daughter Alexandra (Shailene Woodley) telling him that his wife’s been cheating on him. What we get in the film are Matt’s attempts to care for his daughters, calling upon the troubled older one to help with the younger one Scottie (Amara Miller), deal with his in-laws, who blame him for the accident, and his quest to track down his wife’s lover. He’s a smart guy but clueless about many things. This film is quirky in the best sense, written with original dialogue and understanding of how people really behave. As in Get Schmidt, it’s full of real people. For example, daughter Alex insists upon having her annoying boyfriend Sid (Nick Krause) around all the time. He is the kind of goofy kid who tends to blurt out what he’s thinking with bad timing and few filters. Comedy relief, I thought. But then I remembered how teenage kids do indeed crave the companionship/protection of their friends when in the company of their parents. Sid is an important part of the story. Matt finds the “other man,” real estate agent Brian Speer (Matthew Lillard), and also meets his wife Julie Speer (Judy Greer) and their kids. Kudos to Payne for casting Lillard, a guy who whose looks lead us to wonder why Elizabeth would choose Brian over Matt. It’s not so simple for Matt to meet them and find out more about the affair from Brian’s point of view and Julie’s point of view, in the context of Elizabeth there in the hospital bed. Matt needs to know if Brian loved Elizabeth. The discoveries tell us quite a bit about Elizabeth and Matt’s marriage. Everyone is important here, including Matt’s cousin Hugh (Beau Bridges) who is eager to see the land sold, to Elizabeth’s dad (Robert Forster), full of resentment and bile toward Matt for being a stingy bad husband. The kids are well cast. Alex has to rise the occasion to help her dad and Woodley gets it just right, maintaining that wonderland between adulthood and childhood. This is her first major motion picture. Amara Miller does well too in playing Scottie, although her role is small. The movie skips a few beats when it tries to be the outright comedy that it isn’t, like when Matt runs like a bat out of hell to his friends’ house to find out who Elizabeth’s lover is. The most amusing moments are organically woven into the film, as are the most wretched ones. Can you or should you curse – or forgive – someone who can’t respond? And for what reason? Those questions do come up, gently. The characters answer for themselves, just as we have to.